Google.com is the world's most popular search engine - plus. Google.com's innovative approach to algorithmic search pushed search engine technology to a new level. Before Google.com, search engines based search results on how many times a searched keyword or keyword phrase appeared on a page. Launched in 1996, Google.com fundamentally changed search by basing results rankings on how many links have been made to a web page, and where they come from. Analyzing links is a proxy for judging how valuable a page is for a particular search terms, based on the idea that if someone thinks a page is worth linking to on a specific term, that page is probably relevant to that term. This is still the fundamental concept that drives Google's ever-changing search algorithms. It all sounds very complicated, but people clearly find it pretty simple -- and valuable. By the beginning of 2010, Google was used for more than 72 percent of U.S.-based searches, and more than 80 percent of searches worldwide. Google.com has the most traffic of any website in the world, according to web traffic ranking site Alexa.com. Beyond search, Google.com owns and develops other products, most of which are offered for free. These include the well known and popular Gmail.com, Google Maps, Google Earth and Google SketchUp. Integrating its product line is a specialty of Google.com. 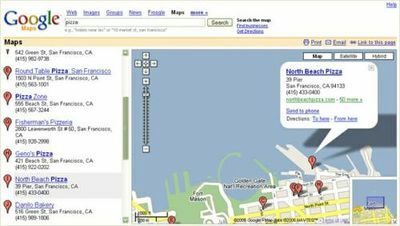 This Google Map incorporates a business search. Google Chrome -- A web browser developed by Google.com. Google Maps -- A fusion of different mapping technologies with other Google.com services to create robust interactive maps. Places, directions, reviews and businesses in your area, all at your fingertips. Google Earth -- A specialized application that lets users view anywhere on Earth in 3D, using satellite images and advanced technology. Nexus One -- A smartphone released in January 2010 that competes with Apple's iPhone. Google.com Sketchup -- Software for designing 3D sketches on your computer. Gmail -- A free email service that organizes messages into "conversations" so that users can easily follow an email string. AdWords -- Technology that allows advertisers to target their message to people searching for specific keywords on Google.com. Adwords offers both banner ads and less obtrusive text-based ads. AdSense -- Google.com invites website owners to place unobtrusive advertising on pages related with related content. Analytics -- Creates traffic statistics for websites and works with AdWords so webmasters can optimize their advertising campaigns based on traffic. Blogger.com -- Arguably the most popular service for online blogging, Blogger was purchased by Google.com in 2003. Orkut.com -- The popular online community/social networking site was created by a Google.com employee as an independent project. Google Sites -- Jot.com created a system for building a website from templates. Google purchased Jot.com in October 2006. YouTube.com -- The acquisition by Google.com of this online video powerhouse for $1.65 billion in October 2006 made headlines. QuickOffice.com -- A user friendly, seamless and yet powerful way to view, edit, sync and share documents anywhere, anytime. It has been acquired by Google in 2012. Other Google.com offerings include desktop widgets, a web-based calendar, photo organizer and editor, spreadsheet and writer application, price search engine, news listings, weather information and more. See GoogleLabs for more developments. Some people go to Google.com every day just to see the new logo. The company's ever-changing logo, or "Google doodle," is famous for reflecting holidays, famous people's birthdays, current events, anniversaries of historic events, and more. Doodles are created by a team of artists dedicated to the doodle. Dennis Hwang leads the team, and has been covered by many news organizations for his imaginative and prolific output. Enjoy a survey of Google's holiday logos. Gmail is very popular with the Nigerian advance fee fraud syndicate. When you get spam from Google's network, or referring you to a gmail.com dropbox address (Reply-To:, etc. ), save it to a file, complete with all the headers, and mail it to gmail-abuse@google.com. Google never acknowledges these spam reports. I use Google every day and it's my default search engine, you can find just about anything with Google. I've got one issue with the Google search results though. They tend to favor big, big sites like the Wikipedia, About.com and Yahoo answers to the extent that just about any search you do will have a Wikipedia and/or about.com entry in the first 4 results, even if the page is of low quality. I already know about the Wikipedia and the other big sites so to me it would be much more convenient to have them left out of most search results so I can find other sites. The best search engine ever. What's the answer to every problem in the world? Google, of course! There's nothing you can't find by utilizing Google. Google is really an amazing search engine, and has pretty much anything you would want to find! Find addresses, pictures, books, news, video, and of course, just websites. What I love google for is that it doesn't just look for how many times a word or phrase is in a page, but rather it tries finding what you most likely would be looking for. Google is also great for webmasters! From a simple search box to an actual server, Google's got it! I recommend Google to anyone who wants to find what they're looking for. Everybody knows Google. They're a cultural phenomenon. The best things about this company are their corporate guidelines ("Don't be evil") and their commitment to taking good ideas and executing on them amazingly. Simple, Efficient and it works. Okay, so it can take a bit of getting used to to work well but Google search and all other Google products are superb. I think Google does a better job than Bing or Yahoo in returning relevant results. It is also simpler and quicker to use. My only issue with Google is that it is too strict in assigning backlinks. While Yahoo backlinks are loaded with errors (they contain sites that don't even link to the site you are checking), and Bing also has errors (but less so than Yahoo), Google seems incredibly difficult to get backlinks with. It appears that any backlink that is created by the owner of the site (e.g., blog posts, articles, etc.) are simply ignored, even if the pages have high PR and are relevant to the site. It seems the only way to get a Google backlink is to obtain it from a site that appears to have created the link independently of the target site owners action. While backlink spam should certainly be ignored in the algorithm, links from relevant pages should be included, regardless of who created the link. It's strange really because Google Adwords makes you pay every time someone clicks on your ads, so the big question is how do you really know that Google is not clicking your ads? Why does Youtube get to be displayed on Adwords and on other people's websites? Did you know when you use Adsense on your website(s), you're getting paid to become non famous and you're getting paid to advertise other website(s). How is it that people love to pay Google when there's a question that no one can answer only Google can prove but yet has not proven. Why is it on the most popular keyword results, massive companies get displayed and not lower level websites? Google is not for putting small website companies on there because they won't replace the massive companies on the search results. Google is not fair where at the top of the list on video results they have GoogleVideo.com on it Youtube.com, Yahoo video, MSN video and many more massive companies. Google is not fair and will only display rich companies on the big search results. Questions after questions and nobody cares. Posted by Anonymous on 19 September 2007. The reason that google shows massive companies over minor ones, is because they display them by the popularity of a web site, and the massive ones actually have things like commercials and such to help them become known. Simple as that. Also, google owns Youtube.com so they get more advertisement. Response by TJ - Owner of ModdersNation.net on 1:52pm, 16 December 2007. Gmail being used by spammers? Sweatshops create thousands of Gmail accounts daily, which are used as "drop boxes" by advance fee fraud spammers. Google is one of the scammers' favorite throwaway account providers. Posted by clsgis on 29 October 2010.